Kahlenberg has launched a fully integrated air horn that incorporates the compressor, tank and valve, all in the same housing. The Z-320-SC meets a demand in the market and Kahlenberg UK has also placed orders for European customers for this model, which offers full compliance with IMO requirements for vessels between 75m-200m. The only connection required is a low amperage single-phase or three-phase electricity supply. While perfectly targeted to commercial and military vessels, we also see the option for this to be installed as a secondary standy-by signal for superyachts also and predict we’ll be supplying a n umber of these units in coming months, such has been the demand prior to production commencing. This is a game we’ve increasingly enjoyed over the years at Kahlenberg UK but Seawork 2017 was our best yet event for spot the brand. All around the pontoon we had great examples of Kahlenberg installations aboard the vessels featured. 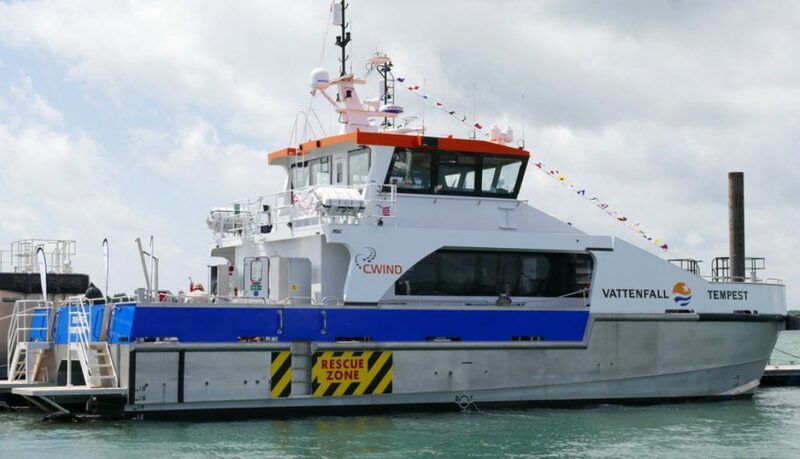 The example shown on the pic here is of the 21m Vattenfall Tempest, a crew transfer vessel operated by CWind off the south east coast of the UK. It’s one of many wind farm support vessels in Europe now successfully operating with the Kahlenberg KB30A horn hailer. 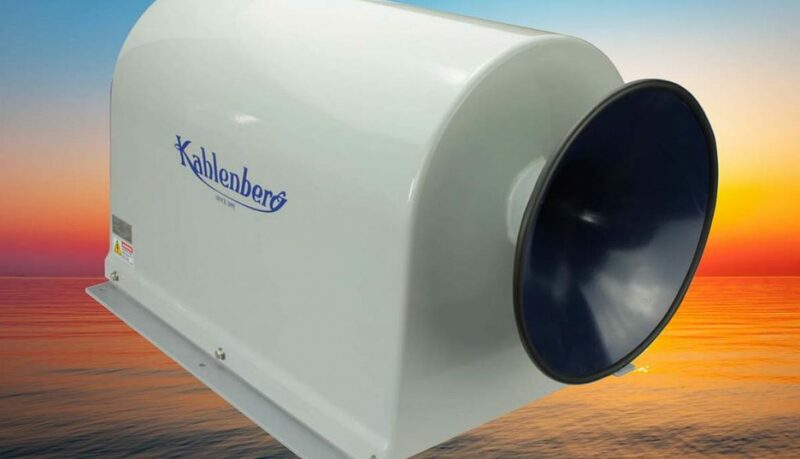 Kahlenberg UK is pleased to announce the launch of the new D-330 twin projector marine air horn and S-330-DVM-H single trumpet heated marine air horn at Seawork International 2012. 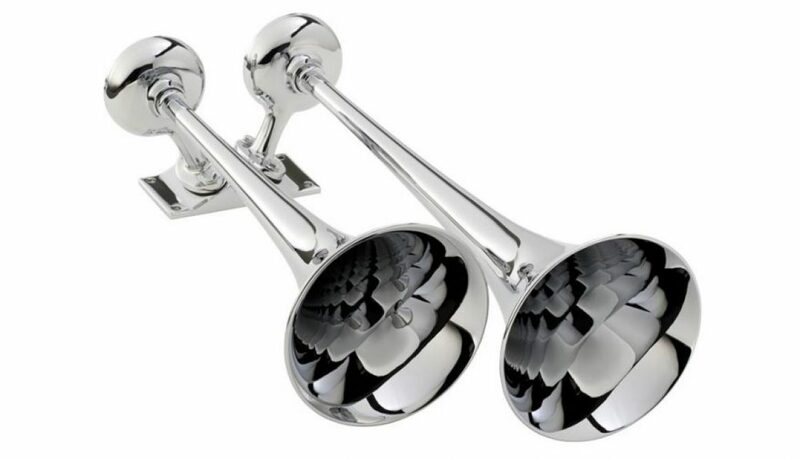 The Kahlenberg D-330 provides a fully IMO compliant ABS type approved twin trumpet sound signal in an economic and compact package suitable for use on vessels between 20m (65ft) and 75m (246ft). It is particularly suitable where low installation weight is desirable. The D-330 has been carefully designed in Kahlenberg’s anechoic chamber to provide a consistently powerful and distinctive sound for a minimum of air supply. As with all Kahlenberg sound signals the D-330 is built in quality materials — spun brass and with a highly reliable titanium diaphragm. It can be supplied in sky white powdercoat or chrome. The fundamental frequencies of the Kahlenberg D-330 marine air horn are 330Hz and 280Hz and its SPL dB(A) is 133dB. Air consumption is 18CFM (8.4 l/s) @ 100psi (7 bar). It works on a wide range of pressures from 50-200psi (3.5-14 bar). It measures 563mm x 288mm x 181mm (22.3in x 11.3in x 7.1in) and weighs just 4kg (9lb). The D-330 can be run from onboard air supplies or from compact compressor kits. Kahlenberg UK will be pleased to advise on installation requirements. Kahlenberg has also released a new version of the S-330 that was launched last year. This features a heated operating valve offering dual electric operation with a manual override to provide for redundancy, enhancing crew and vessel safety. The S-300-DVM’s heater is watertight and thermostatically controlled. It operates on 24VDC and 120VAC or 230VAC. The finish of the horn is TGIC sky white powdercoat and it can safely operate down to -4°C. The S-300-DVM can be mounted to vertical or horizontal surfaces. As with the Kahlenberg D-330 this model is fully ABS type approved and suitable for vessels between 20m (65ft) and 75m (246ft). Both models can be seen on Kahlenberg UK’s stand at Seawork, B111.